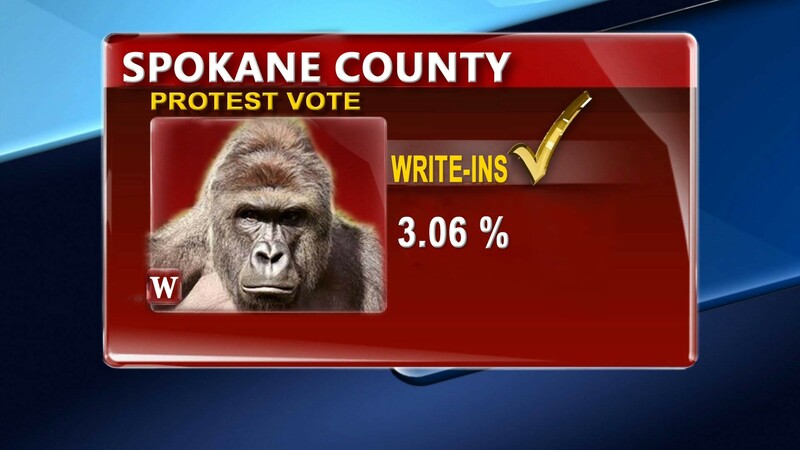 The "Justice For Harambe" party was just one of many official write-in candidates in Washington state. However, individual write-in names are not recorded unless the votes could determine the winner. But Trump's victory in Spokane County comes with a sizable asterisk. Spokane County is a solidly Republican country — 52 percent voted for Republican Josh Kerns for county commissioner despite Democrat Candace Mumm's city council experience and name recognition. Yet Trump, unlike Romney in 2012 or Bush in 2004, couldn't crack 50 percent. He got 48 percent of the vote — slightly less than even McCain got in 2008. Clinton, however, pulled in less than 42 percent. But a full tenth of the Spokane County electorate who turned in ballots voted for neither. We'll lump together all these votes — third-party votes, write-ins, and ballots with the presidential field left blank — and call them "protest votes." Since Washington state, like Idaho, isn't a swing state, it's not surprising that many unhappy voters would feel free to cast a protest vote. Not only that, but Spokane County voters appear to be more defiant than the rest of the state: Only about 6.2 percent of the votes in Washington tallied so far were protest votes. In Spokane County, about 4.7 percent of voters chose Libertarian Gary Johnson, triple what the Libertarian Party got in 2012, and 11 times what it got in 2008. Libertarian votes barely even registered in 2004. And as for the Green Party's Jill Stein? Her vote — 1.36 percent — was still pretty small, but still a lot better than the less-than-half-a-percent the Green Party got four years ago. And how about write-ins? At least 3 percent of voters chose to write in their own candidate. In 2012, only 0.85 percent did. Meanwhile, over 1 percent of voters who turned in their ballots just flat out left their ballots blank, nearly double the rate in 2012. Nationally, third parties did better than they've done in two decades. Even in Trump-friendly Idaho, 13 percent of voters refused to vote for either Trump or Hillary, with 7 percent casting their vote for independent candidate Evan McMullin. Contrary to a few polls taken during Trump's nadir, McMullin didn't win Utah. But the conservative Mormon candidate still managed to pull over 20 percent in the heavily Mormon state. Not bad for a political unknown.